Ermina Avdagic, Tracy Samuels and Alicia Oates who work at Honey Lane, 1 Sewardstone Close and Ashbrook Court care homes in Waltham Abbey took part yesterday (June 27th 2016) in a very special training day in London with celebrity chef, Ainsley Harriott. 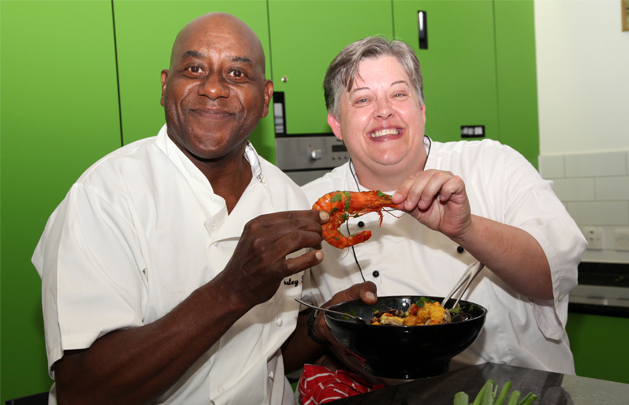 Ainsley launched a Food Challenge for the care homes and other homes in its group, aimed at inspiring its chefs to come up with a new, creative and innovative dining experience for its residents. Ainsley spent time with the three chefs demonstrating some of his recipes and sharing his top tips. Ainsley commented: “I am passionate about good food and exciting people to create wonderful meals and dishes no matter where they eat. It’s great to see these three care homes investing in this competition and I know that all three chefs will embrace the challenge ahead and produce a fabulous new menu idea for the residents”. The chef’s menu idea will be presented at a community event in each of their homes in early October. If their menu idea is shortlisted in the Food Challenge they will receive a visit from Ainsley on 20th October to receive their prize.